Many people get their iPhone bricked when updating to iOS 12. It also happens sometimes that your iPhone gets bricked when you are using it just for your daily use. You might get the question: how you get an bricked iPhone and how to unbrick iPhone? There can be many reasons getting a bricked iPhone. It happens when you do something accidently without knowing the right process of doing it on your iPhone. Or the process is not supposed to do and you do it, so your iPhone gets bricked. Some possible reasons can be that you download an app or something from the malicious website which bricked your iPhone, you interrupt any software update (for examole, iOS 12 update) or power off during an update, or too many apps on your iPhone are working so that the system can not run normally. Bricked iPhone is not a big issue so you can fix the problem by yourself at home.There is no need of getting nervous and wasting your time by going to any technician. You unbrick your iPhone by some simple search on the internet by yourself. Remember that always use trusted source of information and follow the instruction, and then you can unbrick your iPhone. Hard reset is a frequently used solution for many iPhone problems. Little problems can be quickly resolved by this way. We also recommend you try this tip when your iPhone is bricked. Here are the easy steps for you to do hard reset. 1. Press and hold both the Sleep/Wake and Home buttons at the same time. 2. Keep for about 10 seconds until you see the Apple logo. Then you can release both buttons. 3. Your phone will restart normally and be back on the home screen. Many people unbrick their iPhone with iTunes, but when you go to unbrick your iPhone using iTunes, you have to erase your internal data. So it is better to opt for some other tools to unbrick your iPhone without data loss. Here we introduce a third-party tool iMyFone D-Back to get your iPhone unbricked. What Is iMyFone D-Back ? 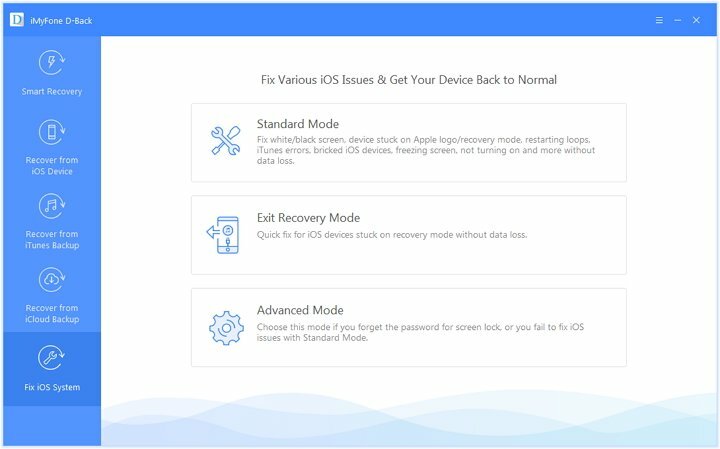 The feature "Fix iOS System" comes with 3 options. It makes it possible to fix your iOS system without losing the data on your iPhone. You can turn to this program if there are the problems like restarting loop, black screen, white screen and so on. It supports the data recovery of more than 20 file types including photos, messages, notes, and the data of the third-party apps like WhatApp, WeChat, Kik, Safari history and more. It supports all iOS devices and all iOS versions including iOS 12. And your personal data will be safe. It is easy to use and has simple interface. Here are the steps that you can follow to use the function "Fix iOS System" of iMyFone D-Back. 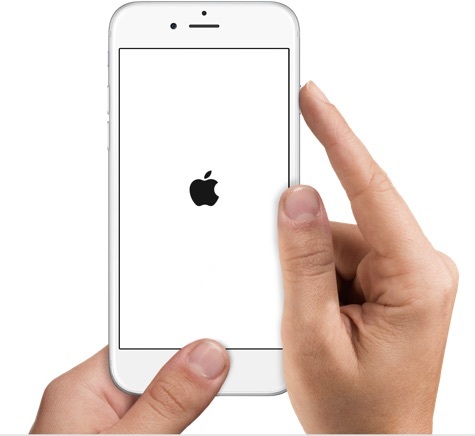 Launch the iMyFone D-Back on your computer and click on "Fix iOS System" from the left side of the main window and click on "Standard Mode". 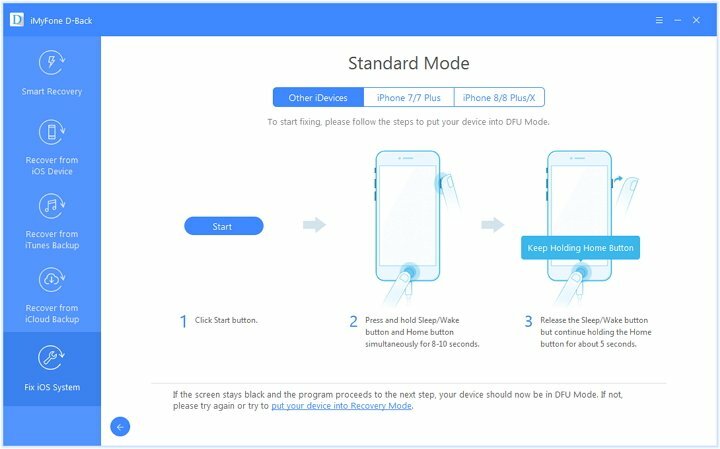 Then connect your iPhone using a USB cable and follow the instruction to pur your device into DFU mode or recovery mode. When the iOS on your device is malfunctional, you need new firmware to fix the problem. 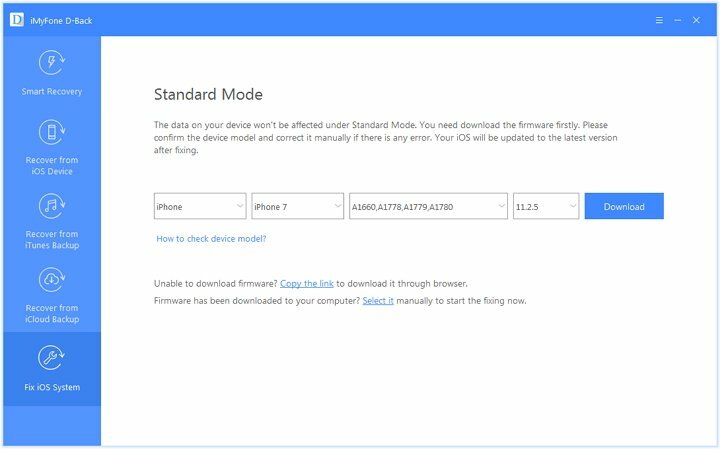 Once the device model is detected, click on "Download" to get the latest firmware. When the firmware download is completed, click "Start to Fix" and then it will begin to repair your device. After it finish fixing your device, your device will start normally. Unplug the device when the process finishes. Your iPhone is ready to use. There are several ways to unbrick your iPhone. If you are afraid of losing data, you can try iMyFone D-Back (compatible with iOS 12). If all the above ways are not working, you will need to trun to Apple Store for help. 1.Connect your iPhone to your computer with a USB cable. 2.Run iTunes on your computer and click the iPhone icon at the top of iTunes once your iPhone is detected. 3.Click the Restore iPhone button on the right side of the screen. 4.Click Restore button in the pop-up window that appears. 5.Wait your iPhone to restore to factory settings. Please kindly note that all the existing data will be deleted if you use this method to unbrick iPhone.